We’d played all the games in the Panic Room‘s secondary location so, after a break for lunch, it was over to Panic Room central for another three games. There’s the usual array of table puzzles to keep you occupied while you hang around for your games, as well as a number of leaderboards for the games in this building. Next up on our itinerary was Old Father Time, down in the basement. I had no idea what to expect from this game – if you’re looking for original themes, then you won’t find much that’s more original than this one! 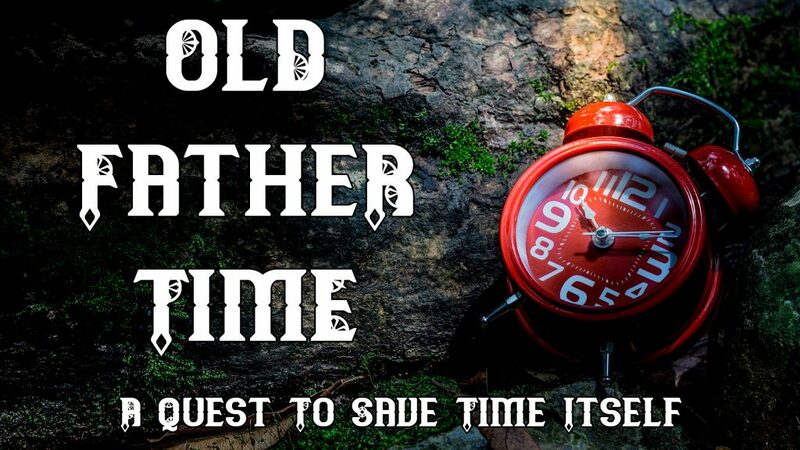 It’s New Year’s Eve and Old Father Time has gone missing. Without him there the clocks won’t reset at midnight and time itself will stop completely. You must work together to find out where he went, restore time and reset the clocks so that time may continue on. Explore his beautiful tree cabin and discover the secrets inside, where time is more important than ever! As soon as we walked into this room, I knew it was going to be special. They’ve managed to capture the beauty of a fairy tale and recreate it in an escape room. The space felt like an enchanted clearing in a forest, with trees and animals dotted around the room to add even more depth to proceedings. As befits a fairy tale, the story is contained in a book, which provides you both with a measure of progress at the start of the game and with guidance on what you’re meant to be doing. More than anything, though, it provides you with a beautiful centrepiece to the game. I absolutely fell in love with this prop. While the cluing system is the same grandfather clock used in some of their other rooms, there’s a secondary, subtle cluing system that’s used in a way that blends beautifully between being just part of the room/story and giving outright help. The truth is I don’t really know whether we were clued or not, and that in itself is an impressive achievement. The puzzles in this room aren’t amazingly difficult and, at times, particularly in the middle section, they descend into some fairly standard escape room tropes. Fortunately, they’ve added little flairs to them to make them that little bit more interesting. One particular puzzle gave a delightful reason for why a fairly standard escape room trope should exist in this space. Two of the puzzles were frustrating. We understood exactly what we were meant to do but really struggled. On both occasions it was partly related to lack of ability on our parts but, in my opinion, they could have made small modifications to the puzzles that would have fixed the issues. Maybe the zen-like nature of the room let them get away with those drawbacks but, for some reason, it didn’t spoil the experience for me. We escaped in forty-seven minutes having been nudged on a couple of occasions. Here more than in almost any other room I’ve played I really didn’t care about the time: solving puzzles quickly wasn’t the aim – it was all about the experience. This was, without a doubt, one of the most charming rooms that I’ve ever had the pleasure to play. I often take delight in the ambiance of a room, but I can’t think of anything that matches the opening experience I had in this space. Yes, there are flaws to the game, but they didn’t take away from that opening sequence. They’ve captured a fairy tale and locked it in a room. If you get the chance, go along as a couple and hang on to every moment. While the game is marked as being suitable for six, it’s not a big space, so I really wouldn’t recommend more than three.